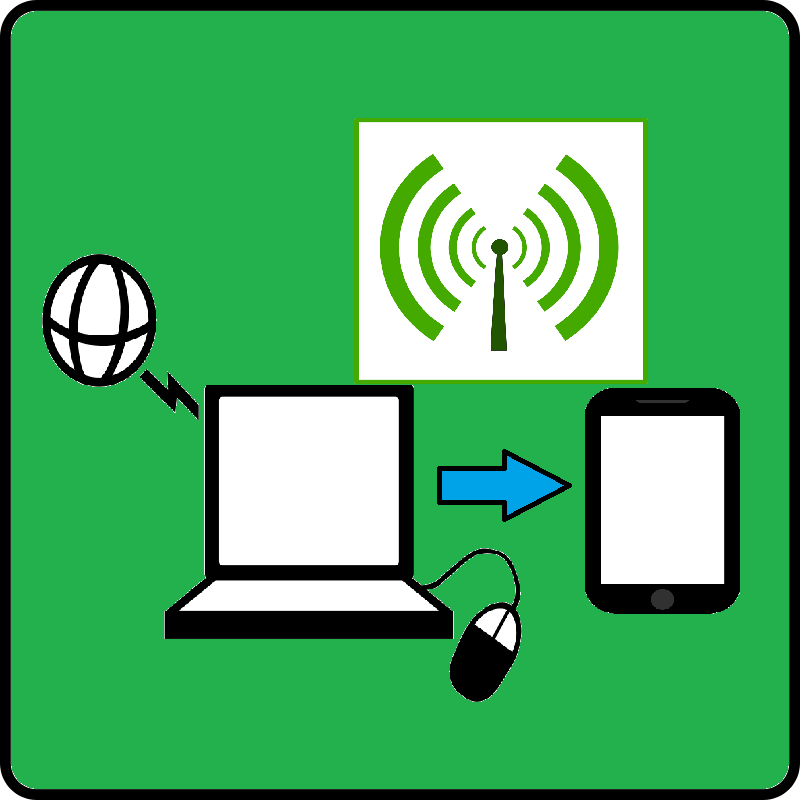 Reverse Tethering – Connect Internet from Computer to Mobile. Tethering is one of the feature which makes possible to connect and access internet in PC or laptop from mobile. Android gives this feature as an inbuilt over USB, WiFi and Over Bluetooth. But what if, you want to access Internet from your phone to check WhatsApp message, Gmail account or any other and you don’t have Data packet, then you might think for Reverse Tether i.e Access Computer or laptop internet in your Android mobile or other mobile. This post will give you direction to do the same, i.e Connect Internet from computer to mobile, Reverse tether, without rooting your android phone. Windows 7 or Windows 8 PC with WiFi and its drivers installed and which have an access to internet with any means i.e Broadband, from other mobile, or with Net setter. Your Android device or mobile device with WiFi feature installed. If above three requirement, are fulfilled, then here are the set of steps to implement reverse tethering. 1.) Make sure, that your PC or Laptop is connected with internet. 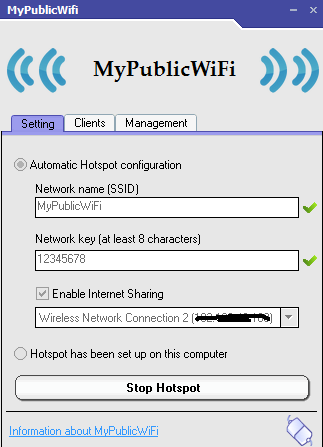 Install MyPublicWiFi software and run it as administrator. 2.) Set desired network name(SSID) and Network key i.e password. Let Enable Internet sharing check box be checked in, and select the appropriate network connection from which you are accessing internet in your PC or laptop. 3.) Press “Set up and Start Hotspot“, this makes your PC as hotspot. If all works fine then, this button label will be changed to “Stop Hotspot“. 4.) Turn on your Mobile WiFi, and search for the network, that you just created. 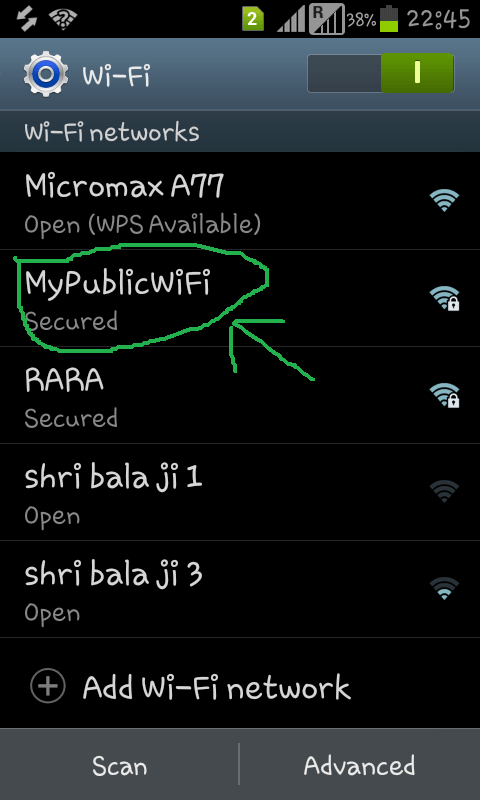 In My case, Network Name is “MyPublicWifi“. Connect to it, if prompted to enter password, then Enter the Network Key, that you entered or set during 2nd step. Well you are now connected to Computer Internet in your android mobile or other mobile device. If you find any problem, while implementing Reverse Tethering, do comment below. If you have any other ideas or any suggestion for the same, your valuable comments are always welcome. You can use Virtual Router . on using different passwords unintentionally; one alphabetical and the other numeric, the device indicated connected without a problem. trying to connect to internet is the problem now. in case of another fluke,will let all know about it. 3. shared the dialup internet connection with wireless internet connection(mypublicwifi) ; Control Panel\Network and Internet\Network Connections in windows 7 . i think this is the step that i was missing. finally, author could kindly check if that was a bug that let me connect with different passwords and what the risks are. can someone elsewhere get thru to my internet connection and mobo by guessing passwords? but im a little afraid someone else could connect. is this possible? please clear my doubts . Thanks for a practical app.kudos! and dont forget to check antivirus firewall if using one. connected immediately after closing it. have used mypublicwifi for a couple of days now and i like it; it’s practical and useful for me. the only problem is that when i put my windows7 laptop to sleep, the router/mypublicwifi will not work again so i have to restart windows and make sure i dont forget to put it to sleep before i have ended surfing on the phone. any updates? Hey Manof. Thank you for the analysis and your value comments and suggestion. Just saw the word firewall from one of the comments and it fixed 🙂 Thanks a lot working. I can’t connect my laptop internet connection to mobile. i have done the same process but not connected. how can connect that? use virtual router Software it is fast and reliable . This will not help me since i want reverse tethering via USB with no root …i found some articles on-line but they are out dated and not working. Most require root. in my android phone it shows connected but i am not able to open web pages. plz tell what shud i do……. It works, i never knew it would be so easy! 2 Thumbs UP! Thank you Sooooooo much !!! Cant get easier than this !! extremely helpful post ! its not work properly when i install it give me a error install as run as administrator while i install administrator tell me what i do. Well there were a bunch of different things that I had to do for this to work. Mainly I had to manually enable Internet Sharing from my LAN connection to my Wireless Network Connection 2. The problem with obtaining ip address seemed to be solved when I changed from DCHP to Static and back to DCHP. To do this you simply go to the wifi network that you created and then go to advanced options on your android device. Other things might need to be tweaked but those were the main ones for me. mypublicwifi is not working. it is not started yet. my system dnt have wifi connection…. ““““““““i want to connect internet from my system(data card) to my mobile via wifi or data cable… i tried installing my public wifi.. all r done.. but when clicking on set up and start hotspot.. it just loads and again shows the same.. as u said its not showing stop hotspot… help me with this… 🙂 ty..
It’s admirable. It really works!!! well, i think i have some problem regarding connection , ithink coz of my computer, so if u can help.. If it doesn’t wrok it means you made a mistake! Check it out again! which IP address will shown in server while using reverse tethering PC or Mobile??? Up and running on Windows 7.
hi ! my english is very bad, sorry. What if we want to do the same via bluetooth…! hi, I do not have wifi on my pc , but have Bluetooth , is it possible to do reverse tethering or not? Plz give me the suggestion…from where I get external wifi for PC’s…because I have no wifi and bluetooth in my PC…please help me..I am very helpless..
How to open internet through MyPublicWiFi in my mobile . Please give me step by step process installation..
unable to internet access while shows connected? Thank you so much it really works..
the public wifi was not detected in my android phone. I could connect the the mobile through laptop and the signal of wifi connection also visible on mobile. But not able to open any web site or whatsapp connection. It’s not working. Saying Authentication Problem in my mobile after sharing the internet with the MyPublicWifi too. wow , thanks a lot for the instructions . they helped a lot !! where i can get or know the password? thanks sir, it really works! reverse tethering is not working..
connected but with no internet access, Mods. any solution please? I bought a yureka phone last mnths Back..
Hi… Pls help me… I done with the setting of MyPublicWifi with Network name(SSID) as Danger and password some 12345, checked the Enable Internet sharing and choosed the option Wireless Network Connection (0.0.0.0) and clicked on Set up and Start Hotspot. After few seconds it shows Stop Hotspot in the button. Its worked properly upto here. But when i turned-on the Wifi in my Android mobile it doesn’t shows the Network name(SSID) as Danger. So i am not able connect to Wifi of my PC. And it shows the Clients tab of the MyPublicWifi as empty. can whatsapp gets connect (work) to Reverse Tethering (Connect Internet from Computer to android smartphone) or tethering; (i.e other than 3G/4G/Wi Fi connections)? When i am clicking on “Set up and Start Hotspot” its not working not enabling hotspot. It should display ”Stop Hotspot” option but its showing “Set up and Start Hotspot” option only. What to do ? I’ve tried this before but I used another software that time. I will try this one maybe it is much better than I use before.